These questions where asked in a forum I visit. WHAT ABOUT SUICIDE? Can it be forgiven? Is it not written that blasphemy against the Holy Ghost, is the only unpardonable sin? The questionnaire has yet to answer the questions himself, but his questions prompted this response and I would like to share it so that other may share it freely if they so wish. The questionaire advocates salvation by works. It always saddens me to see those that advocate “self salvation” to bring up suicide. It is always served with a generous portion of apathy and contempt for those who do commit suicide, and even those who are depressed to the point of considering it. There will always be someone that defines suicide as murder and try to state that murderers cannot be forgiven and end up in God’s heaven. The reasoning goes if you can save yourself you can likewise condemn your self. But the bible says that “all” are condemned already. From that we must be rescued. But what does the bible say about murderers? It says they shall not have a place in God’s heaven. But when the Spirit of the new law of Christ says that we are ALL murders if we get angry at our brothers for no reason, it kind of levels the playing field huh? Like it or not we are all murderers! Have you not heard that if you break one of Gods laws you have broken them all? Do you think King David will be forgiven his adultery and murder? How can a murderer be a “man after gods own heart”? I submit to you YES and that it is because David realized that “in him” was no good thing and long before he had anyone physically murdered, he had said in his heart “RACCA” ( not deserving of forgiveness) in anger against his brothers and had already committed murder. Just like Abraham, David was justified in Gods site by faith and blessed is the man to whom God will not impute sin. The “self salvation” folks show their spiritual maturity to be null and void when they take the line of reasoning that people who commit suicide cannot be saved. The see no value at all in the prefacing suffering. They would even ridicule ‘Christian suffering” and sport a bumper sticker that says “to blessed to be depressed”. They would look upon those that are not like wise “to blessed to be depressed” as beneath them and possibly not even real Christians. But the question is “what does the bible say about depression?”. Some folks need to do a word study on suffer & suffering! Christ said we must share in his sufferings. Jesus is called the Suffering Servant in Isaiah 42:1-4. Isa 53:3 says of Jesus “He is despised and rejected of men; a man of sorrows, and acquainted with grief: and we hid as it were our faces from him; he was despised, and we esteemed him not.” Jesus said we like him shall suffer for his names sake. Paul shared in Christ sufferings. He often said he wished to be absent from the body and to die was gain and preferred. He only wished to hang around for the sake of those whom he had been given charge over (us gentiles and the churches he had planted). Christ suffered and said my God my God why has though forsaken me? Remove this cup from me if possible. What was that cup? It was the cup of suffering! It is safe to say that in Jesus humanity he was depressed and not jumping for joy. But he went to that cross anyway because of the joy that would come from it afterwards. It was what he was sent to do!!! Do you partake of the cross and the cup of suffering? Imagine this !!!. You cannot grow if you only have one “mountain top” experience after another. You only grow in dependence on God and spiritual maturity in the valleys of despair and helplessness. We are clay and He is the potter. How quickly we forget that if clay had feelings, it would hurt the clay to be molded and formed into something. How quickly we become unsympathetic towards the clay. Suffering will make us or break us. Wounds are ways to reveal us! The real us!!! Suffering, and the way we respond to it, will show us where we are at in our walk with God. Can a wild horse be tamed unless it is first broken? Can a servant of God make a good servant unless he is first broken and made into something else? I realize that some do not have the temperament disposition to get depressed often. But even those less prone to depression will have valley experiences too. Life is not all fun and games ya know. Life is painful. More so to some than others. To live is Christ to die is gain. I’m so tired and so weary but I must go on. Till the Lord come and takes, takes me away. There will be no sadness , no sorrow, no trouble I see. There will be peace in the valley for me ! someday !!! I believe that some that commit suicide are deranged and delusional and are not really aware of what they are doing. But I believe that most that commit suicide are just tired of living and hopeless. Kind of like when an 80 yr old man loses his companion and he just turns his will to live off and dies shortly afterwards. Is that suicide also??? But I hate to be the one to tell some of you, but suicide can be the biggest act of faith ever. 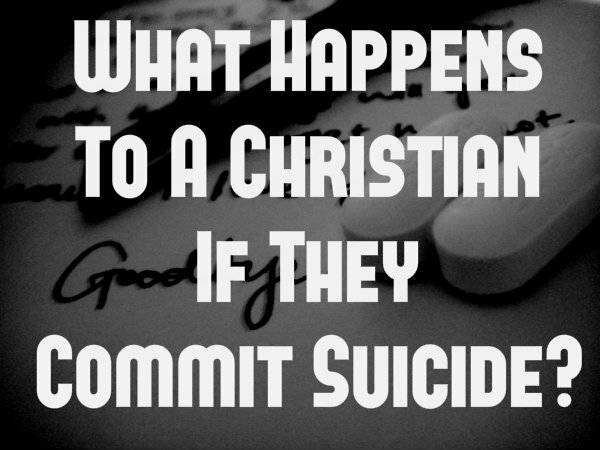 I don’t buy into the idea that a Christian will commit suicide just because he is sick of living this life. If a Christian commits suicide, yes he is tired of living this life but he does not expect to just end it and life is over, he expects to fall into the loving arms of his savior and to be face to face immediately. It is never Gods will for anyone to commit suicide. Yes Jesus told Judas to go do what he had to do but it was Judas’s will to die. Jesus did not hang him there. I don’t think Judas was in his right mind. After all he betrayed the one that loved him. That would be called “grieved to death” if you ask me. It is really disparaging to interact with people who would have shunned Jesus in his moments of trail in the Garden of Gethsemane. People like to play with words and try to say killing is murder. Consider this, Jesus knew he was to be taken and crucified, he said so before Judas betrayed him. Since Jesus knew he was to be crucified, did he commit suicide or self murder because he did not flee but went willingly to the cross? Can you really know how God feels unless you too have been scorned and utterly rejected by the ones you love? Ask Hosea!! Would it destroy your faith to know that God too gets depressed and is very empathetic to those who are depressed and broken ? Blessed are the meek and the broken hearted. For theirs is the kingdom of God!!! Suicide and Salvation by Damon Whitsell is licensed (FOUR YOUR FREE USE) under a Creative Commons Attribution-Noncommercial-Share Alike 2.5 Australia License.Based on a work at how2becomeachristian.info. This comment was a response to the posting of this article in a MSN discussion forum. It is added to encourage you to share this article with anyone whom you may know that is struggling with the suicide of a loved one. To forward this to someone, click on the BLOG article title link to go to the article webpage and click the “SHARE” button at the bottom right of the page.